Merry Christmas to me. 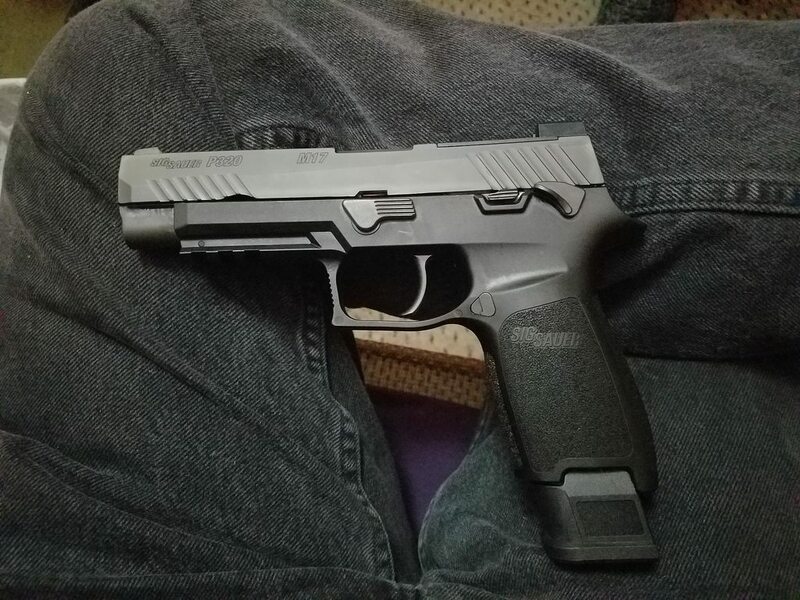 Sig Sauer P320 M17 Bravo in 9x19. Came with two 17 and a 21 round magazine. Tritium sights are installed by default, which is a plus for me because I am a sucker for tritium. Got some 40 gr., .223 rounds at a Parking Lot Sale. Claim 3600+ FPS, going after some varmints that have been bothering me ! Got back to this thread but can't EDIT ! Here is a stock Photo of my latest Windham Weaponry - .223, luv the feel of this one. Added new Sights but haven't sighted in the Rifle, this weekend will be dry and warm one so hoping for the best ! Thinking on a scope, need to keep it around $300.00, any ideas ? I like Leupold though I live almost down the road from them, Vortex seem to make a good equivalent too. I will check the Leupold Scopes out, any particular Models that hold up better than others ? The ranges are all pretty solidified when you're down at the prices you and i want to spend. So no, nothing really sticks out. As it's for your AR, maybe choose the patrol optic instead? *EDIT never mind, that is about a 600 dollar part. VX Freedom range is where you'll want to start. I looked at the VX-3 (?) - 3.5-10, 50mm, not sure of the exact model, I used the desk top, now on the Laptop... ! $500.00, on the high side of my budget and maybe a little too big, thinking going to 40mm, same zoom factor and less expensive. I need to sight-in the Iron Sights first then go and check out the scope locally. VX3 is fairly fancy, i only have the VX1 and it's replacement the Freedom - VX2 seems to have been partially replaced by the freedom line. I would consider one of the Freedoms with a 50mm objective. OK thanks, I will check them out when I get there. So many choices, that is exactly why I asked for ideas. If you can stretch your budget a little more, I'd pick up a Leupold Mark AR. I have a 3-9x40mm with the mildot reticle on my target AR. I wouldn't buy ANY other scope for the .223/5.56 cartridge. It's as simple as dialing it on to your desired range and pulling the trigger. No doping. No math. Mine is calibrated for the 55 grain projectile but if you like to shoot heavier projectiles, the Leupold shop can make you any custom turret you need. With the mildot reticle, if you don't know your desired range, then you can quickly and easily use the mildot system to estimate range accurately. Just pick an object of known size (say an average fence post is 5ft or whatever) and see how many mildots that takes up on the reticle. I bought a Mildot Master slide card to go with it and unknown target range is dialed in within seconds. If you're good at estimating range or you use a rangefinder, then the Mark AR will just be adjusted to your known range and you make the shot. Easy peasy. Mine is stupid accurate. I've considered selling mine lately though, as I'd like to buy another Mark AR but in a 6-18x40mm because I like to stretch it out to much longer ranges. I'd like to be able to see my holes in the target better at times as well. But mine does awesome out to 250 yards so far. I just need a spotting scope to see the hits on the target. Thx, the MilDot is a good suggestion. I will review all of the suggestions from the site ! Does anyone thing we have too much info available on the Web, there are SSOOOO many choices. I imagine you'd love the Mark AR. No math/doping, no taping your doping cards to your rifle, etc.. Couldn't be any more simple. It's really nice to be able to just dial-n-shoot immediately. With my Mark AR scope and my range finder, I can be on target with the very first shot, usually within a couple MOA of the bullseye. If I already know the range, then I just dial the scope to that range and make the shot. Perfect every time, and the scope/gun is more accurate than I am. I find that the more confusion and calculations you can remove from any situation, the better off you'll be in the long run. "KISS" rules apply here. I looked at the Mark AR .223, nice looking scope. Th only scary thing is the price... $499.99 Retail, Turners, locally, has it for $449.00, and I have a $50 coupon, so it would still run me $400; $100 over my limit... might work ! Going to look at one tomorrow and get some hands on, will let you know where I stand after that. Now to get an early X-Mas present ! Thanks to all for the info for the Scope... hoping for 5 shot/1" pattern at 100 yd. They can be bought cheaper if you're Google-fu is strong. You might think about getting something higher powered than a 3-9 though. A 4-12 might be a better choice. 6-18 if you really like to stretch her legs. My scope is definitely capable of making those 5 shots within 1" but it's ultimately up to the shooter as you know..
At your budget you'll be stuck with second focal plane stuff for the most part. So magnification when zeroing vs when shooting will be important to keep track of. Thanks, i will keep it in mind. Page processed in 0.2496 seconds (24% database + 76% PHP). 95 queries executed.